Wool - Tribulations of Hand Spinning and Herbal Dyeing: Dyes from Brown Onion Skins on Wool, Silk and Cotton. I'm actually quite amazed at the depth of colour you got by boiling the onion skins. I've always just simmered them, getting good colour, but nothing like that. Wonder if it works for red onion skins as well. Should do - must try it. red onion skins always gave olive greens for me, esp. on light grey fibres. and I wouldn't call onion skins substantive - because the lightfastness improves a lot with a mordant (which wouldn't be the case with true substantive dyes). also I always let the dyed skeins/fabrics dry without rinsing. if you leave the rinsing for a week or two, it'll improve fastness as well. and if you dye consecutive batches in your onion "vat", you'll get all colours of yellow, from dark orange, nearly brown - to very light "icy" yellow! if you add iron to those lighter yellows you'll end up with gorgeous green tones that work perfectly with the yellows... 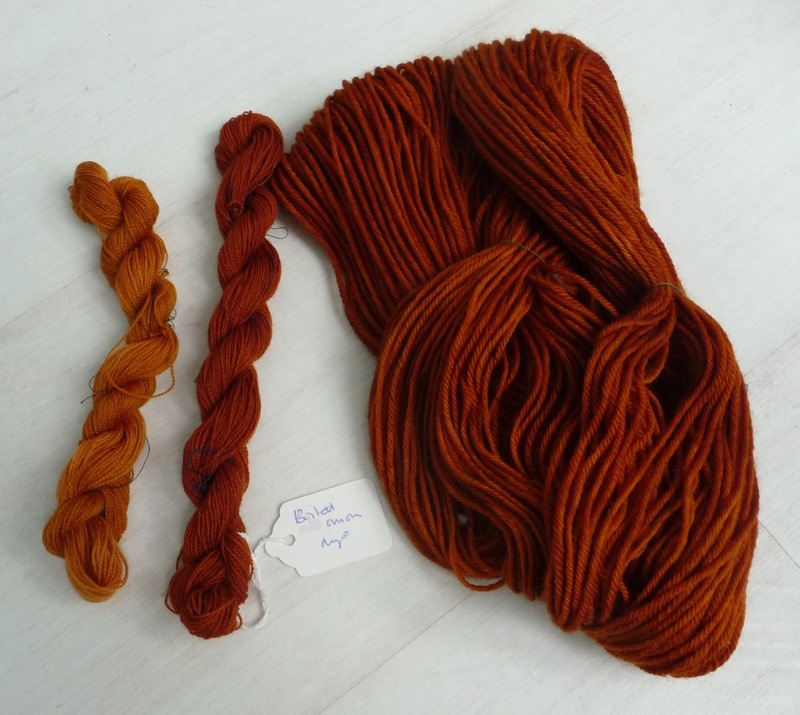 I've done a lot of onion skin dyeing about a decade ago - still have some of the skeins in my stash:)the only thing I didn't manage - to make a ratio of 1:1 - with 500 to 800 g of WOF, there was no way to find a pot that's large enough for that amount of dry skins:) didn't matter though, I still got strong colours. I had read that an alum mordant improved light fastness, but the trial skeins I dyed last autumn haven't had enough sun through the winter to fade yet. Good to know it is worth mordanting, before I dye for a proper project. I am saving up onion skins again, I really fancy that plan for a proper sequence of dyes and iron mordants. what a glorious range of colours! It's such a good dye, I can see how handy it would be to have it 'on tap'. Interesting idea.